Crafted for brewing tea in classic infusion-style, Bonjour's beautifully unique and elegant swirl oval teapot with cream and sugar features a clear borosilicate glass pot with a transparent glass infuser to enhance everyday tea drinking and ensures a chic touch to tableside tea service when entertaining. Intended for loose teas, the swirl oval teapot will delight your senses with the aroma of fragrant herbs, delicate blossoms and the taste of a adept pot of tea. Borosilicate glass resists shock and breakage. 34-ounce/ 1 liter capacity. This Stump teapot completes with an extra-fine 0.3-mm stainless-steel infuser and it enables you to steep fine loose-leaf teas such as Rooibos tea to large whole-leaf teas like Oolong tea. This teapot is also ideal for use of tea bags. Stackable design allows you to save storage spaces especially for food-service market such as tea rooms, cafe, bars and restaurants. This 2 qt. 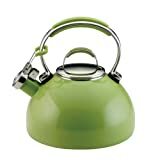 teakettle features a comfortable handle made of stainless steel accented with color-coordinated soft silicone rubber. The kettle whistles when water comes to a boil and has a removable lid for easy cleaning and filling. 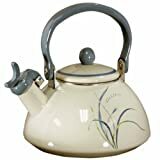 Enjoy this 2.2 quart enamel on steel whistling teakettle with harmonic hum. Decorated in the Corelle Coordinates pattern, Coastal Breeze. Green tea lovers no longer have to struggle to achieve the optimal steeping temperature, while darker tea drinkers can still expect impeccably boiling water. With an innovative temperature control system, this versatile device can heat to your preference. At last, an all-inclusive kettle for heating water for the perfect pot of tea. This durable stainless steel kettle is a must-have for tea lovers of all kinds. Perfect for foodservice, restaurant and other professional industrial uses. Bulk pricing available through Adagio Wholesale. Made in China. 30 oz (1L). Tea lovers rejoice in this Old Dutch tea set. It includes everything you need to enjoy tea for two. And its heavy-duty construction makes it perfect for indoor or outdoor use. 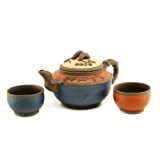 From green tea to black tea, you can enjoy your beloved hot beverage whenever and wherever you want with this Old Dutch set. OXO's Kettles – The Pressure is On In 1998, OXO introduced its first Tea Kettle. Safety and practicality were the guiding principles during the development process, and our little Kettle came complete with an innovative steam shield. Through user feedback, we realized we missed a key consumer insight – that a Tea Kettle, while a practical kitchen tool, is often a centerpiece in the kitchen. Users would leave them out on the stovetop when not in use and some even coordinated their entire kitchen decor around their Kettles. 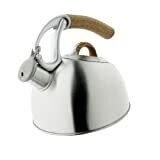 While the steam shield was innovative, it was considered by many to be unsightly (some likened it to the "Flying Nun"!). In 1999, we corrected the aesthetic flaws to our otherwise safe, practical and well-performing Kettle with the Uplift. The kicker is that all of its elegant aesthetics came as a direct result of making the Uplift safe and easy to use. OXO Good Grips Uplift Tea KettleFun Fact: The OXO Uplift Tea Kettle has an iconic shape that has become an instant American classic. It is the most requested OXO item used in propping television and movie sets. Look for it next time you watch "The Big Bang Theory!" Problems Identified Handles on tea kettles are positioned too close to the steam and hot water at the spout, making it uncomfortable while pouringAngle of kettle handles combined with weight of filled kettle make it difficult for users to lift and pour without straining wristsFine motor skills required to open kettle trigger to pour hot water; difficult for many older users to maneuverSmall opening on top makes it difficult to clean interior of kettle The Process The quest for the splendid interaction point between the spout and the handle (so the kettle would not open when carried around filled with water, but would open easily when tipped forward) led us to the current connection between the spout and handle, one that resembles a splash of water.The same connection point was also designed to keep the spout open if the user chose, so that they could keep the Uplift's whistle quiet while boiling water, which is especially handy when preparing an early morning cup of tea.While designing an opening large enough to be easy to clean, we needed to ensure it wasn't so low as to limit the maximum water level, but we still needed to keep it in balance with the spout for aesthetic reasons.Through user research, we learned that steam would sometimes escape from the lid and unfortunately heat the handle, so we added a silicone seal to minimize any unintended heat transfer and keep the kettle safe and easy to use. OXO Good Grips Classic Tea KettleOXO's Solutions Large, comfortable handle is angled away from the spout and is heat resistant and non-slip, even when wetHandle angle allows user to hold Kettle comfortably and without wrist strain, whether filled with water or nearly empty, by adjusting grip accordinglyWhistle spout opens automatically when Kettle is tipped to pour – no awkward buttons or levers to pressWide opening on top of Kettle enables easy access for cleaning and can also be used as an opening to fill Kettle The OXO Story: In 1990, OXO staged a revolution (of sorts) by offering an easy-to-use, high-performing alternative to uncomfortable and ineffective kitchen gadgets. OXO's innovative take on the traditional Swivel Peeler, complete with its pudgy black handle, raised consumers' expectations of what could be expected from household products. Today OXO offers over 800 products, each developed with a close (some might say "obsessive") attention to detail. Our goal is to deliver products that maximize comfort AND performance, illustrating our mission to create innovative consumer products that make everyday living easier. Hamilton Beach K6080 Large 1.8L Liter Cordless Kettle, Black Type: Electric Kettle Features: 1500 watts boils water rapidly Cordless kettle lifts off base for easier serving Rubber-gripped handle Easy pull-up lid Illuminated on/off Auto shutoff when water boils Boil-dry protection Dual water windows Capacity: 1.8 liters Height: 10.88" Width: 8.25" Depth: 6.75" Weight: 2.64 lbs. The adept cup of coffee is easy to brew with the Proctor Silex 12 cup Coffeemaker. Enjoy conveniences like auto pause and serve, lighted "on" switch, dishwasher safe filter basket and carafe, and easy view water window .